In this buyer’s guide, we’ll review 8 of the best footballs on the market in 2019. We’ll look at a few really awesome options (like the ones the pros use) as well as a couple of more reasonably-priced balls for casual use. 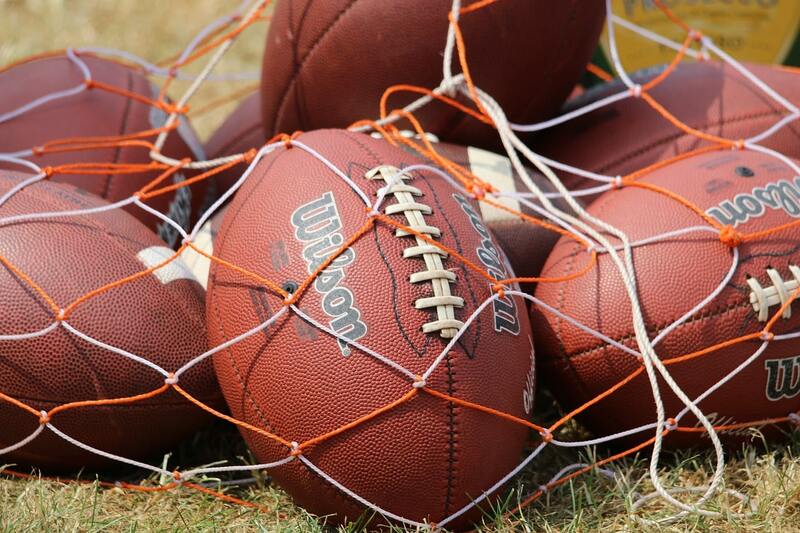 First, let’s look at some of the best footballs on the market. We’ll review each one in terms of performance, durability, and value for money. This is what the pros use. But what’s so special about an official NFL football? Firstly, this ball is made in the USA out of top-quality leather. As a result, it feels awesome to kick, catch, and throw – the weight and size are perfect for adults and kids over the age of 14. This leather material also offers excellent grip, because Wilson have gone for a “deep pebble” texture, meaning you can keep throwing 70-yard bombs even when it’s wet. Even though the cover is made of leather, this is still an incredibly tough ball. The double-lace design won’t begin to come apart easily, in large part because the laces themselves are made of tough synthetics. There’s also a triple layer VPU bladder, which simply doesn’t leak. However, we wouldn’t recommend using this ball on hard surfaces (like concrete) – the surface can scuff up relatively easily. Ultimately, if you want the best possible quality, this is the ball for you. However, for some players, it’s simply not worth spending this much money on a football, especially if you need a large number of them for practice. Feels awesome to play with. Good grip – works in all weather. What if you want a quality Wilson ball (and access to the 1-year warranty they offer) without having to break the bank? Fortunately, the company have a number of more reasonably-priced options which are still awesome footballs. This composite product is one such option. The main benefit of composite materials (as opposed to leather) is that they’re much cheaper. Although synthetics don’t quite feel the same as the real deal, Wilson have done a pretty good job ensuring this ball is great to play with. It’s weighted nicely, meets official NFL size regulations, and offers excellent grip. Plus, composites won’t soak up water on the pitch, and they’re suitable for use on the driveway/road. The outer shell and bladder are very durable, and the ACL lacing system is very tough indeed. However, this ball will fly a little further than a proper leather option. It also comes a little deflated but without a pump – this is fairly typical for most footballs though. Essentially, if you want an authentic-feeling ball but don’t wanna spend $100 on something your dog might chew to bits next week, this is a fantastic option. Still comes with Wilson’s 1-year warranty. Flies a little further than a genuine leather ball. For the high school/college athletes out there, you need to be practicing at home with the same sorts of balls you use in real games. Meaning, something made of leather which is very slightly smaller than an official NFL ball. But at the same time, you won’t wanna spend too much (especially if you’re buying 10-20 training balls). The Wilson GST NCAA ball is exactly what they use in college and high school football. It’s approved for use by the NCAA and NFHS – the organizations which manage high school/collegiate sport in America. What this means is this: the ball is incredibly well-made (as you’d expect from a leather Wilson option). It’s manufactured in the USA, and the stripes are sewn on – meaning they won’t begin to fade or rub off like they might on a cheaper ball. Although this football is a little smaller than an official NFL ball, it won’t sail over the horizon if you punt it really hard. Wilson have actually made it a decent weight, and the leather behaves just like a game-ball should. Just in case you were wondering what GST means, it stands for “game-saving technology” – it’s a branded term that Wilson came up with. Essentially it means that the ball has a little bit of extra grip. The main issue with this option is its price – it’s relatively expensive considering it’s not an NFL-spec ball. But it’s definitely worth paying for if you’re training for high-school/college level football matches. Smaller and easier to grip – matches what’s used in most HS & college leagues. Not too light, but not too heavy. Durable – surface grip won’t fade. Younger kids (aged 10 and under) may struggle to grip a full-size football. At this stage in their development, it’s worth getting something smaller and lighter, which is easier for smaller hands and feet to control. This bundle from Wilson has everything you need to get your son’s football career up and running. Not only does it come with a ball, there’s an included tee and even a pump – meaning you don’t have to buy one separately. The ball itself is “youth” size, meaning it’s around 19″ from tip to tip and weighs about 12.5 ounces – a regular ball should weigh 14-15 ounces. Obviously this means that it’ll fly a lot farther than your average ball. When your kid transitions into high school football, you’ll need to upgrade to something a little bigger so they can get used to kicking/catching/throwing a larger football. However, changing your ball sometime in the future won’t be a big deal, in large part because this junior football from Wilson is so darn cheap. It’s actually quite hard to believe the price, especially considering you’re not just buying a ball. It’s likely Wilson cut a few costs with the tee design – it’s not incredibly sturdy. But the ball is brilliant – if you’re buying for a pee-wee, it’s hard to go past this deal. Comes with a pump and tee. Ball flies and handles pretty well. N/A – awesome football for the price. Looking for something cheap, but still want a full-size ball? Wilson’s NFL “All-Pro” football is essentially a less expensive composite version of their The Duke ball. It meets the proper size and weight regulations of the pro league, but because it’s composite it’ll fly a little further than a leather ball. However, there are a few benefits to this non-leather material. It’s incredibly durable, and will take a real beating (including hitting concrete) without getting too scuffed up. Plus, as we’ve mentioned before, it doesn’t get waterlogged. What’s more, you can get this ball in youth and official sizes, in case you’re looking for something you can use for junior training. Despite the price, you still get access to Wilson’s 1-year limited warranty, so you don’t have to worry about the seams coming apart or anything. The thing to note about this ball is the surface has a special coating applied to it to increase its tackiness. This can be good for quarterbacks looking for an extra bit of grip in wet weather, but it doesn’t quite feel the same as a leather ball. Ultimately, if you use proper balls in-game, you might be better off looking at picking up a leather ball. This option is fantastic for recreational use though (like throwing matches in the park). Can be used in any conditions and on any surface. Doesn’t perform the same as a leather ball – tackified surface can feel a bit strange. Under Armour’s take on the all-purpose composite ball is an incredibly versatile option. It’s available in pee-wee, junior, and official sizes, so there’s something for everybody. The surface is also suitable for players of all skill levels. It comes with Under Armour’s “Gripskin” technology, which offers pretty good tack in any weather conditions. Plus, there’s a thin layer of foam, making the ball a little bit more comfortable to kick. As a result of the slightly unusual design, the 395 won’t play exactly like a leather football. However, it’s reasonably priced, and very durable. Surprisingly, the weight is also pretty good. This is a well-balanced ball – it’s not too heavy, nor too light, meaning it’s an excellent choice for both kicking and throwing practice. Despite being made of composite material, it doesn’t have that “balloon” feel to it, which is great. We’d recommend this ball to those looking for an awesome pee-wee option, especially since there aren’t really many footballs out there made specifically for kids under the age of 6. Considering what it costs, this ball is a pretty great deal, no matter what size you end up going for. Incredibly durable – can withstand a real beating. Has a good weight to it. Bit softer than a leather ball due to the foam in the outer skin. If you’re on a tight budget, or need to bulk-buy leather footballs, very few of Wilson’s non-composite balls are really appropriate options, as most of them are fairly expensive. The R2 is one of the cheapest proper leather footballs on the market at the moment. But even though it’s relatively inexpensive, Rawlings have really made the extra effort to ensure that this is an awesome ball. They’ve gone for horween leather, which has a very deep pebble texture to it, providing added grip for quarterbacks and receivers. Even the stripes have an extra bit of tack to them – and this grip won’t fade for absolutely ages. You also get a “soft-touch” surface, which makes the ball a little easier on the hands in particularly cold weather. However, the skin isn’t too soft (which is what we criticized the UA 365 for). This ball feels just like a game-ready NFL football – but without the hefty price tag. The only real reason this isn’t a more popular ball is the fact it’s not made by Wilson. Apart from the lack of association with such a well-respected brand, there isn’t really any issue with buying Rawlings. They even match Wilson’s quality guarantee – you get a 1-year warranty with this ball. Great price for a leather ball. Nice soft feel to it – but not too soft. None to mention – excellent value for money. We’ve looked at a heap of Wilson options already, so where does this product fit into their overall range? Basically, this is a leather high-school sized ball. It’s a little bit smaller than an NFL-spec/college-size football. As a result, it’s slightly cheaper than their The Duke ball for example. Apart from a nicely-textured leather skin, you also get extra-tacky stripes, which won’t wear out easily when exposed to humidity or extreme cold. Since this ball is NFHS-approved, it’s a bit lighter than most other leather options. However, it still flies really nicely, and feels super-satisfying to kick/catch. It’s not just great for high-school players though: if you’ve got slightly smaller hands, or just want something that’s a little easier to handle, this ball is a great buy. However, for serious players, you’ll likely outgrow this ball quite quickly. You’ve got a bit of a dilemma here: on the one hand, you need to practice with what you’ll be using in-game, but on the other, you don’t wanna spend hundreds on a few balls only to have to replace them in a year when you progress onto college football. Overall, this ball is still a quality option. We’d only really recommend it for competitive high-school athletes or those looking for a slightly smaller ball though. Awesome all-around performance: for kicking, catching and throwing. Quite small – competitive HS players will outgrow it quickly. Now we’ll discuss some key things to consider when picking the perfect football. Why are some balls so expensive? The first thing you probably notice when looking at different footballs online is the massive difference between the cheapest and most expensive options. Why exactly are some balls so expensive? Some footballs cost a lot simply because they’re commemorative items and aren’t meant to actually be used. They’re normally inscribed with the name of a team, like the previous year’s Super Bowl winner. Obviously if you’re looking for something to throw around in the park, you should probably avoid these balls. The other type of expensive footballs are official game balls. These are what the pros use, and as a result, they have a deeper surface pattern for enhanced grip, stitched-on stripes, and are often made with top-quality leather. By comparison, the cheaper balls out there don’t feel anywhere near as nice to throw. They can also come apart relatively easily (especially at the seams), and are made of cheaper composite materials. However, they’re still fine for the odd throwing match at the park. If you’re looking for the best-possible quality, there’s no going past Wilson when selecting a football. They make the balls used in the NFL in an all-American factory in Ohio. Even their cheaper options are fantastically well-made. In fact, every single one of their footballs comes with a 1-year limited warranty – most other manufacturers don’t offer any such guarantee. If you like the look of a ball from another brand, be sure to give its reviews a close look before buying. Rawlings and Under Armour also have a few options on the market, but you should be careful when buying from smaller brands. Their balls are often made in China and can break apart quite easily. Leather footballs are the real deal. Made with actual cowhide, these balls feel awesome to use (both for kicking and throwing). However, they’re generally a little more expensive, and can wear out if they hit concrete/asphalt surfaces repeatedly. Go for leather if you’re looking for a top-quality game ball. Composites on the other hand are a slightly cheaper option. They’re a little bit tougher, but won’t feel anywhere near as nice to use. Some composite balls have a sort of “light” feel to them, meaning they travel a good 6 yards further than your average ball would when kicked. You basically need to consider how much you wanna spend and what you’ll be using your ball for when choosing the right material. Pee-wee footballs, for those aged 6-9 years old. Junior footballs, for those aged 9-12 years old. Youth footballs, for those aged 12-14 years old. Each is a touch smaller than an adult-sized ball, making them a little bit easier for kids to grip. The only other difference between the two is that kids’ balls and are normally made with composite materials. You’re unlikely to find a proper leather pee-wee option. Obviously, you’re going to need a ball pump of some description to keep your ball inflated. If you’re just using the ball for casual practice or throwing around in the park, you can simply give it some air when it feels a little soft. Some balls come with a pump – be on the lookout for one of these deals if you don’t already have one. Remember to keep the ball between 12.5 and 13.5 PSI if you’re playing a serious match though – unless your name’s Tom Brady 😉😉. I wanna practice my throwing, what should I be looking for? For all the quarterbacks out there, you’ll want a ball with good grip so you can throw it properly. This means something with a deep pebble surface that’s slightly tacky to the touch. If you’re a kid, it also means finding a ball that isn’t too big to hold. You also want a ball with decent weight to it. There’s nothing worse than throwing a balloon – if your practice ball’s too light you’ll notice yourself overshooting your receiver in-game. But if the ball’s too heavy, your passes won’t reach the target. This is why it’s worth investing in one or two match-quality balls to use at home, especially as a QB. I wanna practice my kicking, what should I be looking for? It’s a similar story for all the kickers out there. You want a football that’s the perfect weight, otherwise you’ll be mis-calibrating your kicking leg for something that’s too light or too heavy. You also want this weight to be balanced properly. A cheapo ball that’s top or bottom heavy won’t fly particularly well, impacting your ability to kick field goals accurately. The shape is also something to consider. Fatter balls tend to be more forgiving if you mis-hit them slightly, while narrower balls will prove to be more of a challenge, especially when kicking field goals. Ultimately, because the feel of the kick is so important, it’s crucial to practice with a leather ball as a punter/field goal kicker. This is especially true if you use non-composite balls in-game. Browsing online, you may have noticed a few different balls advertised as “approved by” a certain body – normally an abbreviation beginning with the letter N.
NFL balls have been approved by the National Football League for use in their competition. 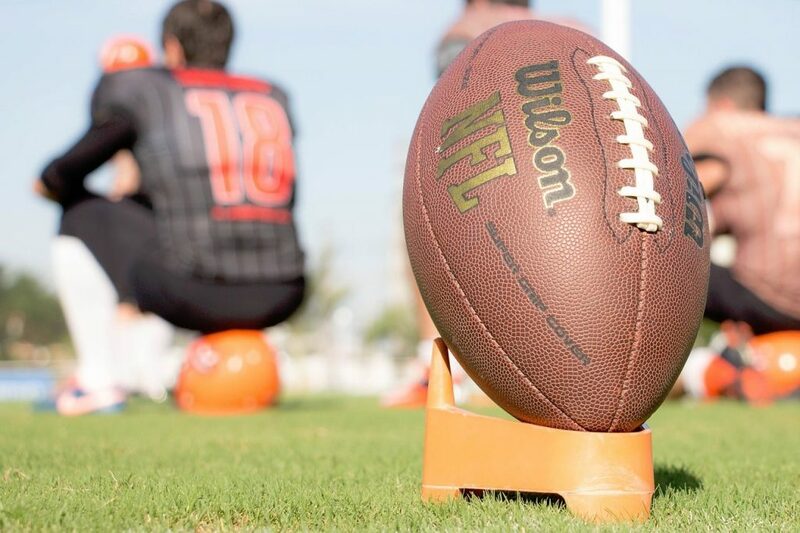 There aren’t actually any strict size/weight specifications for what can be used in the NFL – balls just have to be around 11″ from tip to tip and around 22″ around the belly. The NFL accreditation basically means that the ball is made of good-quality leather and will feel awesome to play with. 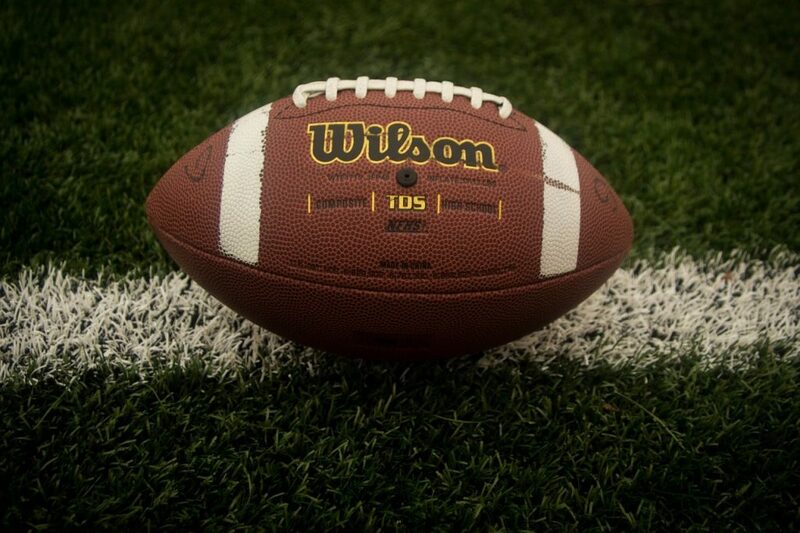 NCAA approval means that the ball has been inspected by the National Collegiate Athletic Association and is fit for college football matches. Again, this organization have pretty high standards – if they’ve approved a ball, you know it’s going to be a good one. However, college footballs are typically a bit smaller than NFL ones – about 10.5″ long and 21″ in circumference around the widest part. NFHS accreditation means that the football has been inspected by the National Federation of State High School Associations. Since this body sets the rules for nearly all high school football leagues, their accreditation basically means that the ball is suitable for 12-18 year olds. The ball will be the same size/weight as a collegiate football, or sometimes slightly smaller. NFHS have a handy list of all the balls they’ve approved so far. Proper leather footballs tend to absorb a little bit of water when it’s wet outside, which will make them temporarily a bit heavier. This isn’t necessarily a bad thing – it just adds an extra challenge, both for the defense and offense. It’s another reason you really wanna be practicing with a real ball if possible. The weather can also wear out your ball – if you’ve got a bag of footballs, it’s definitely worth keeping them in your garage or house rather than in the yard. Humidity/frost can be a real issue for both composite and leather balls. Both extremes can lead to the surface cracking and losing its grip, or the ball beginning to feel too hard. You’ve reached the end of this piece! Hopefully you found the right ball for you or the quarterback in your family. Still unsure what to get? Leave a comment below and we’ll get back to you within 24 hours!